For those of you that follow me on Twitter you’ll know that I’ve been having some fun this week with changing out the default VMware generated SSL certificates on a greenfields deployment of vSphere 5 that will be supporting a large public cloud. Changing certificates is nothing new, and in environments that are concerned with security it is common practice. However it has been my experience that changing certificates with ESX(i) and vCenter has always been a bit of a challenge (I have done it on vSphere 4.x before this). It can be very time consuming and error prone, especially if you haven’t done it before. One of the things that makes it hard for people to get this right is that there is no one document or source of truth that explains in sufficient detail what the requirements and supported configurations are or how to implement CA signed ssl certificates in ESX(i) and vCenter Server. This has tripped up many organizations both large and small. I’m hoping that the information in this article will help and encourage more people to change out the default certs (to improve security), and make the process far more reliable and easier to achieve with vSphere 5. This article will focus on successfully changing the default VMware SSL certificates on ESXi 5 hosts with CA signed certificates using a Microsoft CA (it will also work with public and OpenSSL CAs, but I have not tested it yet). For anyone that doesn’t know what an X.509 certificate is here are a couple of links that will explain it. The first one is a good human readable explanation and the second is the actual specification published by the Internet Engineering Taskforce (IETF). Each component in your vSphere Infrastructure uses these X.509 SSL certificates for secure encrypted communications. Each SSL certificate is uniquely generated for each component and ties to the FQDN of the component. So this means every ESXi 5 server has a certificate generated for it based on it’s unique FQDN, as does vCenter, vCenter Update Manager, SRM, vShield Manager and any other components you may be using. This ensures non-repudiation. That is, every system knows that is communicating with the other system that it expects, and it’s not an imposter. This means you can’t just take one cert generated for vCenter for example and apply it to all of your hosts. I have not tested using wildcard certificates (*.domain) with vSphere 5, but in earlier versions some components didn’t support them. From a security standpoint it is much better to have a single SSL cert tied to a single host by FQDN. While I was working through generating and applying the certificates in the environment I was working in over the last week I ran through all of these resources below. All have some good information. But none is a complete end to end guide on how to generate and apply the certificates that will work reliably with vSphere 5 (which is the reason I had to review them all). The reason why I went through some of the older material on this is because it is largely still relevant. But there are some subtle changes to the way that vSphere 5 works that you need to know about to be successful. You will also notice as you read through all of these documents and kb articles that there is a lack of consistency. You’ll notice in the above list of resources are a couple of VMware KB articles referring to issued with the new VMware HA after you change the SSL certificates for CA signed certificates, or after an upgrade where it was previously done. This is the problem that I ran into both in my lab and also in my customers environment (both are new builds with CA SSL certificates). However following the steps in the KB was not successful. The reason these errors occur in the first place is that FDM, which is the New VMware HA, enforces SSL certificate verification for communication whenever a host is configured for VMware HA. So you need to make sure that you also have vCenter set to verify host certificates (vSphere Client, Menu Bar – Administration > vCenter Server Settings > SSL Settings > tick vCenter requires verified host SSL certificates, which is the default setting), otherwise you won’t be able to use HA. This is fantastic for security, but unfortunately there is a bug (is expected to be fixed in vSphere 5.0 U1) that means the new thumbprints on hosts that have had their SSL certificates changed don’t end up in the vCenter database (not good). As a result when you try and configure VMware HA after an upgrade where the certs have been changed, or straight after you’ve changed them in a new environment, VMware HA configuration will fail. After changing the certificates, restarting the management agents on the host, and existing maintenance mode, wait for HA to configure and fail. Once the exit maintenance mode task is completed disconnect and reconnect the host to vCenter. Now you can use either of the methods mentioned in KB 2006210 to fix the SSL certificate thumbprint problem. My preference is to use the pearl script via the vSphere API as this doesn’t require vCenter to be shut down. Once the fix has been applied as per the KB you will once again need to reconfigure VMware HA on the host. You will now notice that it is functioning correctly. Now for the step by step process I used. You could execute a similar process to the one I’m about to describe using an OpenSSL or Public CA and using the Unix/Linux version of OpenSSL, however this is how I did it successfully in my lab and with my customer. As mentioned in the vSphere 5 Security Guide VMware uses X.509 v3 SSL certificates (base-64 encoded) for encrypting traffic between various components. If you CA has been set to support only SHA512 hash that is fine, it will work, although the VMware documentation doesn’t mention it. The two key files for an ESXi host are rui.crt and rui.key. In order to generate the certificates you’ll need to get a copy of OpenSSL x86 v0.98r or higher, and have access to a Microsoft CA (2000 or higher). The certificates will use a standard web server request template. On the system where you will generate the certificate signing request (rui.csr) you will need to ensure you have Microsoft Visual C++ 2008 Redistributable Package (x86) before installing OpenSSL. For the purposes of this process you will use the Microsoft CA Web Pages to submit the certificate request and download the resulting base-64 encoded certificate. You can use the certreq command if you wish also (not covered here). Ensure you have a vSphere Management Appliance v5 (vMA) deployed in your environment, you will use this to execute the HostReconnet.pl script to save you having to shut down vCenter during the process (hopefully won’t be needed when vSphere 5.0 U1 is available). Before applying the certificates to your environment you should ensure that your clients and vCenter server trust your CA, if it’s an AD integrated CA this should be automated, else you may have to pre-trust the Root or Intermediary CA by loading the CA public cert into your clients and vCenter server (not covered in this process). 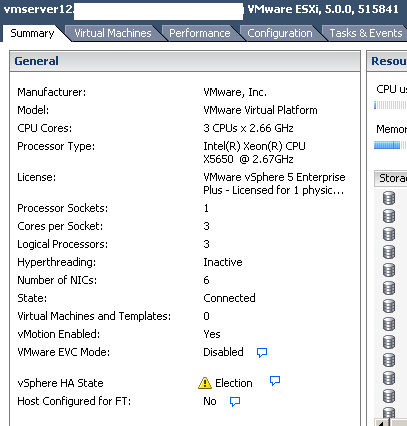 Assumes that the ESXi 5.0 hosts are in a cluster with VMware HA enabled. After having installed Microsoft Visual C++ 2008 Redistributable Package (x86) and Open SSL 0.98r or later on a management system (vCenter or other system, not the CA) open a command prompt and change to the OpenSSL\bin folder. Execute the following command – openssl req -new -nodes -out rui.csr -keyout rui.key -config openssl.cfg. If you have specified all the relevant organization information in the OpenSSL configuration you will only have to specify the Common Name, which will be the FQDN of your ESXi host, and enter twice (i.e. blank/no password) when it asks you for a password at the end. Copy or submit rui.csr to your CA, using the Web Server template, and download the base-64 encoded certificate to the system with OpenSSL that was used to generate the CSR (Screenshots of this available here: How to use CA certificate to replace VMware certificate on ESX(i) 4 and vCenter). Create a folder on the system used to generate the CSR to back up the existing VMware default certificates that are on the host. Enable SSH on the target host, ensure lockdown mode is disabled, and then put it into maintenance mode. Using WinSCP or other SFTP/SCP client change directory on the target host to /etc/vmware/ssl and copy the rui.crt and rui.key files off the host to your backup folder that you created in step 6. Delete rui.crt and rui.key from the target host. Copy the new rui.crt and rui.key files that were generated to the target host in /etc/vmware/ssl, be sure to use Text Mode or ASCII Mode transfer, otherwise you will have problems with special characters (^M) ending up in the certificate file and the process will fail. Open up a console through the remote management card or KVM to the target host and log in as root to the Direct Console User Interface (DCUI – F2 on the console screen). Scroll down the screen till you reach Troubleshooting Options, then press enter. Scroll down to Restart Management Agents, then press enter. Press F11 to restart the management agents (vpxa etc). After the management agents are restarted press escape a couple of times till you log out of DCUI. Ensure that you have copied the HostReconnect.pl script to your vMA v5, you will need it soon. Take the target host out of maintenance mode, and wait for HA to reconfigure and fail (either time out, task completes and HA continues to say election). Disconnect and then reconnect the host (this is currently the missing step from KB 2006210). Once the host is connected and HA agent reconfigured you need to log into your vMA as vi-admin and change directory to where you copied HostReconnect.pl. If this is the first time running HostReconnect.pl execute chmod u+x on HostReconnect.pl to ensure that you can run the command. Execute HostReconnect.pl –server <vcenter server fqdn>, enter username and password of a vCenter administrator when prompted. Monitor the output. You will notice that each host has been reconnected in the vCenter Tasks window. This script reconnects the hosts using their actual thumbprint and updates the expected thumbprint in the vCenter database. Without running this command, or stopping vCenter processes and manually editing the database, the thumbprints will not match and the configuration of HA will fail (as per KB 2006210). Reconfigure HA on the target host, you should notice that the it works successfully and the host is back to normal. Repeat the above steps for subsequent ESXi hosts. Please let me know if you have any trouble with the above process, and also if it works for you, your comments and feedback are appreciated. Note: Steps 16, 18 – 23 are not be needed when vSphere 5.0 U1 or later is used. Great post Michael. During my VCAP4-DCA study I went through changing SSL certs and it's a lengthy process and like you said the documentation is all over the place! Will have to give it blast in my lab. Thanks for sharing. I had myself to go through this but I was able to go through my own CA using openssl. I need now to go through an approved CA and I have been trying to get the specific x509 certificate attributes (keyUsage) that need to be included in the CSR but cannot find anything official about this. I set the attributes as they were in the self-signed ones but the CA will not keep all of those attributes. Did you see this specified somewhere? Does it matter? Hi Alain, I got the keyUsage requirements from the Update Manager KB and also the default certs. The other attributes were a combination of reviewing multiple documents and sources of information in addition to some trial and error. The keyUsage needs to be serverAuth and clientAuth. Yes the steps are required when you are using an in house PKI. For anyone doing a 5.0.1 (U1) update, once the cert is replaced and you've come out of maintenance mode the HA agent will install but the status will be "election" until you disconnect and reconnect the host. As soon as it reconnects the status will change to connected (master or slave) and you're done. No need to run the HostReconnect script. That procedure is if you don't want to run the host reconnect script. Essentially the host reconnect script does the same thing. However if you're on vCenter 5.0 U1 there is no need to even do that as the bug that caused this problem is fixed. OK, got it, thanks Michael. I never looked at the script – thought it was doing more than just a disconnect/reconnect. But it's interesting that my hosts stayed in "election" status until I disconnected and reconnected. Sounds like I shouldn't have needed to do this with U1? Correct, the hosts should have been ok after exiting maintenance mode, as the expected SSL thumbprint should have been updated in the vCenter database. Great post! We are using an internal CA. My question is, do we need to update the vCenter SSL cert first and then all of the hosts or does it matter? Can you advise if I am required to replace the SSL certificates on hosts after an upgrade (via Update Manager)from ESX 4.0 to ESX 5.0 Update 1? Hi Harry, Provided your SSL certificates are at least 2048bit then you won't have to change them if upgrading. Provided you've not installed the Microsoft Patch that requires 2048 bit SSL certs, then you also wouldn't have to upgrade. There is nothing in the upgrade process itself that would require you to upgrade your SSL certificates. Thanks for coming back so quickly. I'm not fully understanding the 2048 bit comments and it may be down to the way I phrased the question (or my lack of SSL knowledge). The existing SSL certs on my ESX 4.0 hosts are 2048 bits so per your comment I shouldn't have to change them doing an upgrade to ESXi 5.0. It's the comment "Provided you’ve not installed the Microsoft Patch that requires 2048 bit SSL certs, then you also wouldn’t have to upgrade." that I'm confused with. I assume that is in reference to vCenter (i.e. Microsoft comment)? In my case I'm creating a new vCenter VM rather than an upgrade so I assumed I would require a new certificate for vCenter anyway. To summarise does that mean I could upgrade ESX 4.0 U1 hosts to ESXi 5.0 with no new certs required and only request new SSL cert for vCenter? One last question if you dont mind – if I decide on a clean install of ESXi 5.0 rather than an upgrade from ESX 4.0 U1 could I save my SSL certs beforehand and re-apply as hosts are keeping same FQDN (whereas new VC is not)? Thanks again. Hi Harry, the MS patch I referred to would also impact your clients (i.e. your desktop etc) when connecting to your vSphere hosts, not just vCenter. But it's not relevant as you've said you're using 2048bit SSL certs anyway. Yes you can save your certificates and then reapply them to the hosts if you do decide to rebuild with ESXi 5. You just need to copy the cert and key off the source systems prior to the upgrade. You will need a new cert for the new vCenter. Hope this helps. I would strongly recommend you go to ESXi 5.0 Update 2 rather than 5.0 Update 1. There are a number of important bug fixes in Update 2, which are listed in the release notes. You should always be on the latest update or patch version of whichever major version of hypervisor you choose to ensure you have the most stable and supportable environment possible. Ah, got you. That's what I was hoping to hear and thanks for the heads up about Update 2 – interesting. Is this procedure identical for ESXi 4.x? Hi Jeremy, it's not identical. The process for 4.x is different to 5.0. 4.0 is quite different to 4.1. vCert Manager will sort out both, in addition to 5.0 and 5.1. You state in your article that hopefully steps 18-23 wont be required once Update 1 has been applied. We have applied Update 2 and I'm about to test the SSL certs process described above for the first time. Can you confirm that the requirement for steps 18-23 has now been removed? I can confirm that steps 18 – 23 should no longer be required as from 5.0 Update 1. The bug that caused the database to not be updated when the cert changed has been fixed. Let me know how you get on with the process. A 2 minute response turnaround. Now that's impressive :-). Thanks Michael. Yes, I will let you know how I get on. Michael, can I safely assume that step 16 only came into play while steps 18 to 23 were relevant? Can you advise if SSL cert deployment in vCenter 5.0 and Update Manager is pretty much on the same lines as with vCenter 4.0? Hi Harry, Correct re step 16 for ESXi. For vCenter you should check out my article I also have articles on vCenter 5.1 in the side bar. I would take caution before using this article with vCenter 5.x. What this article does not state is that unless you generate SEVERAL different sets of certs, one for each vCenter-related service (SSO, Web, etc.). Each service equates to running through this process over again, and each one is different. Hi Andrew, This article is not for vCenter at all and you should not be using this article for the vCenter Server certificate replacement process. This article only covers ESXi. I have a separate article on vCenter 5.0 and another one on vCenter 5.1. The two articles are vastly different and the 5.0 process does not work the same as 5.1. Further to that I was one of the people who helped create and test those KB's. If you want guidance specifically for vCenter 5.1 then you should refer to my article on that topic – Updating CA SSL Certificates in vSphere 5.1. Likewise if you want the process for vCenter 5.0 you should refer to the article specifically on vCenter – The Trouble with CA SSL Certificates and vCenter 5, not this one, which is for ESXi. Links to both of these articles are provided on the right hand side bar of this blog under recommended links. I just followed this in my environment, we're running vSphere 5 U1 build 804277 for vSphere and build 914586 for ESXi. After exiting maintenance mode I still had to disconnect the host and reconnect it to clean up the election state. I just did the disconnect and reconnect through the vCenter client. So, I would say that steps 19 – 23 aren't needed, I still had to follow step 18. I am running version 5.5 u1a, however, I have found that the SSL Thumbprint is still not being populated in the VPX_HOST table – even if I disconnect and reconnect. I was trying to go through the process of running the hostreconnect.pl script in vMA, however, since I almost never use the appliance, I don't know how to do simple tasks like upload the script to the appliance (and where in the file structure would it be?) to run the command. I have tried to navigate the filesystem logged in as vi-admin just to get a feel for the directories, but when a run an LS I only get the bin folder, and then run another LS and get nothing populated in that folder. If you could please give step by step instructions for step "16. Ensure that you have copied the HostReconnect.pl script to your vMA v5, you will need it soon." Thanks! This bug that requires the host reconnect has long since been fixed and is not necessary with 5.5 u1. There is a new process for changing out the certs in 5.5 and you should follow that. It's covered in the VMware KB's and I haven't specifically documented it here. These instructions are for 5.0 only. What’s interesting in our 5.0 U2 configuration, after the host is reconnected to vCenter everything works great with HA. However, in the SQL database when you compare the expected certificate thumbprints to the host certificate thumbprints, the expected ones are blank. The host certificate thumbprints are there and HA is reporting that everything is elected and green. VMware thought that part of the U1 fix was that the expected certificates are no longer populated in the vCenter database. Can someone else confirm that this is the case with 5.0 U2? The SQL query I used was as follows: “SELECT id,EXPECTED_SSL_THUMBPRINT,HOST_SSL_THUMBPRINT FROM dbo.VPX_HOST”. I also made sure that our vCenter’s had the option selected to verify the certificates. i'm using esxi 5.0u3 and i think i followed you instructions to a t, and after the management agent resets, i try to log in to the esxi through the c++ client and it gives me a connection error.